American University Washington College of Law will host the All American Regional Round of the 17th edition of the John H. Jackson Moot Court Competition (formerly known as EMC2). This is a simulated hearing of the World Trade Organization (WTO) dispute settlement system and is organized annually by the European Law Students’ Association (ELSA) with the cooperation of the WTO. The Competition is open to teams from around the globe. The Competition will be finalized in June 2019 in Geneva, Switzerland. This is the sixth year that the law school has hosted the All American Regional Round of this Moot Court Competition. 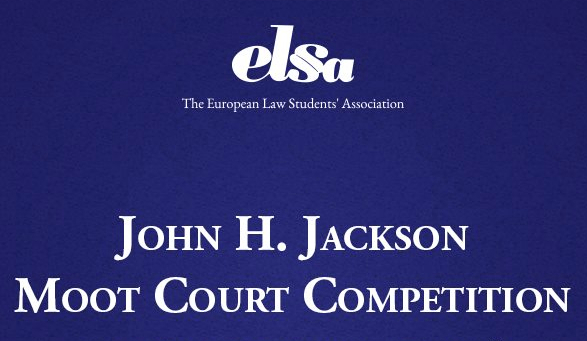 As the Preliminary Round pleadings shall start early on the morning of Thursday April 11, you should book your accommodation and check-in Wednesday April 10, 2019 before 17:00 o’clock. We have reserved a block of rooms at the Courtyard by Marriott Chevy Chase, 5520 Wisconsin Avenue, Chevy Chase, MD 20815 for the nights of April 10, April 11, April 12, and April 13, 2019. This block will be held until March 11, 2019. Further nights may be available upon request. If you would like to take advantage of the special rate of $219 plus 13% taxes for April 10 and 11 and the low rate of $129 for April 12 and 13 plus 13% taxes, please call Marriott Reservations at 301 828.3364, x 7000 or 800 321.2211. Please say that you are with the WCL WTO Moot Court Competition Room Block.